For many, a butterfly's beauty is intensified by the creature's fragility. So it's all the more remarkable that some butterflies, like the monarch (Danaus plexippus), migrate on a journey as long and as arduous as those of many bird species. Monarch Butterfly Life Cycle These tiny creatures cover some amazing territory. Monarchs and Milkweed The poisonous plant is their favorite food. The monarch is often known as the milkweed butterfly. Monarch Migration Patterns Every spring and fall. Where To See Migrating Monarchs These are the hotspots in Florida and nearby Alabama. 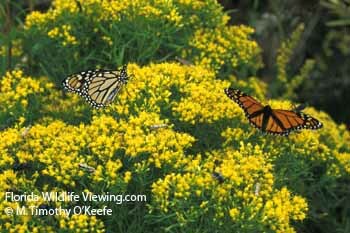 Monarchs in Mexico< A tiny area around Mexico City is the winter destination of millions of migrating monarchs.